Much like its namesake, Amazon stock (ticker: AMZN) is difficult, yet rewarding, to navigate. Over the past two decades, this well-known retail (not technology) company has risen over 48,455%. That’s not a typo. $1,000 invested in AMZN back in 1997 would be worth $484,558 today. That same $1000 invested in the S&P 500 would be worth $1,999 today. Making money in the stock market is easy, right? Wrong. As much as we’d like to think we’re rational individuals, we’re our own worst enemy. 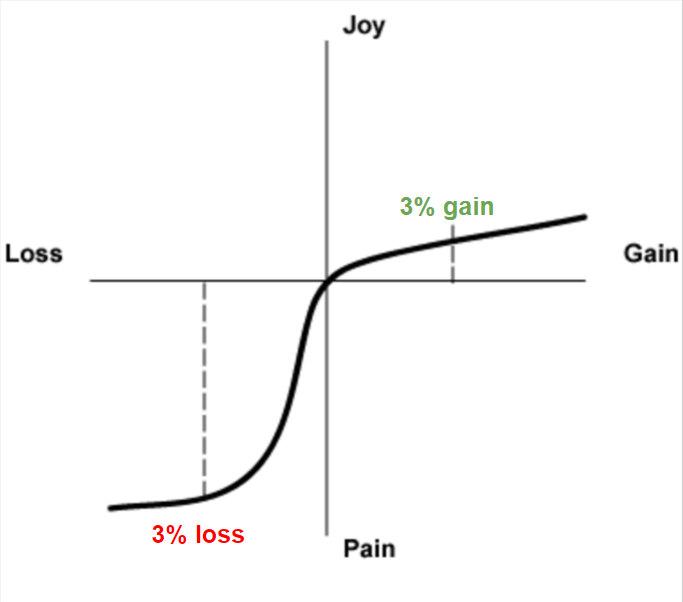 When involved with markets, we tend to respond to gains and losses emotionally. Loss aversion is a real and present danger to many portfolios. Here’s a visual of this common emotional experience. The upper pane (green) is the price appreciation of AMZN stock. Using hindsight bias, many think the tremendous gains in Amazon were a slam dunk and easy to come by. That couldn’t be further from the truth. The lower pane (red) are the drawdowns experienced by holders of AMZN stock. Talk about agony. 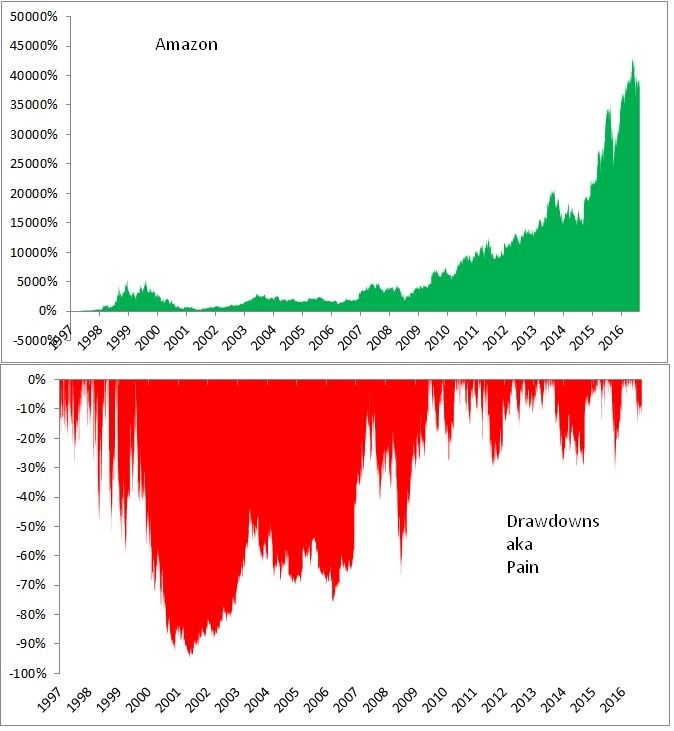 For more than a third of its life as a public company, Amazon has been in a 50+% drawdown. For the buy-and-hold investor, it’s hard to imagine the discipline needed to hold on during 70-90% losses. It’s likely many capitulated under the duress. The good news is, we don’t have to be buy-and-hope investors. In fact, we might even call drawdowns a downtrend! Remember, our number one job as market participants is to manage risk and protect capital. Using supply and demand dynamics (aka price movement) to do so, there is zero reason to experience such massive drawdowns. 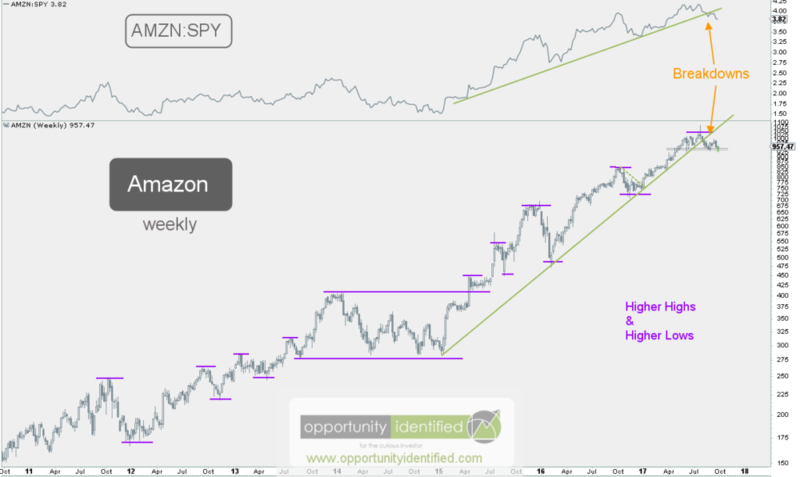 Let’s take a look at the buying and selling going on with AMZN. Amazon has gone nowhere for five months. The battle between supply and demand has created a well-defined Head & Shoulders pattern. Is this a top? We have no idea. No one does. Don’t let anyone tell you otherwise. It could simply be a five-month consolidation. Afterall, consolidations tend to resolve in the direction of the primary trend. This could be a top. It could also be consolidation before heading higher. Our job is not be right or wrong. Our job is to be on the right side of the trade. Let’s a look a little closer to identify some important support levels. Up close, we can see buyers have shown up before near the 935 price level. 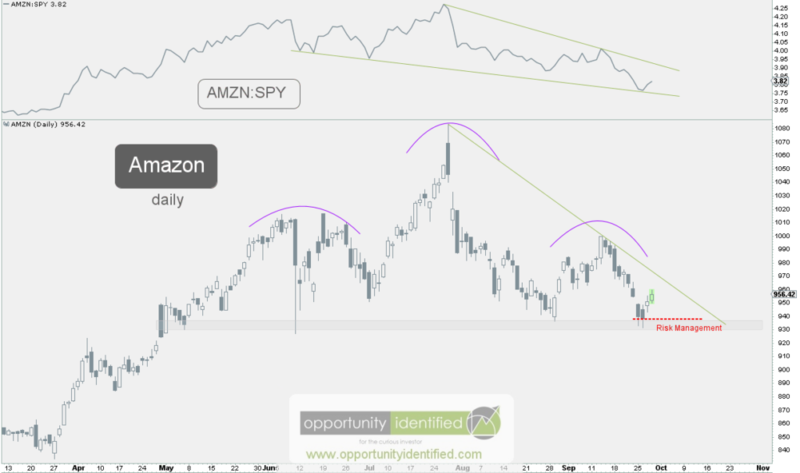 If they don’t show up at this level upon any retest of that price point, we have the evidence we need to make a decision and let someone else have AMZN. 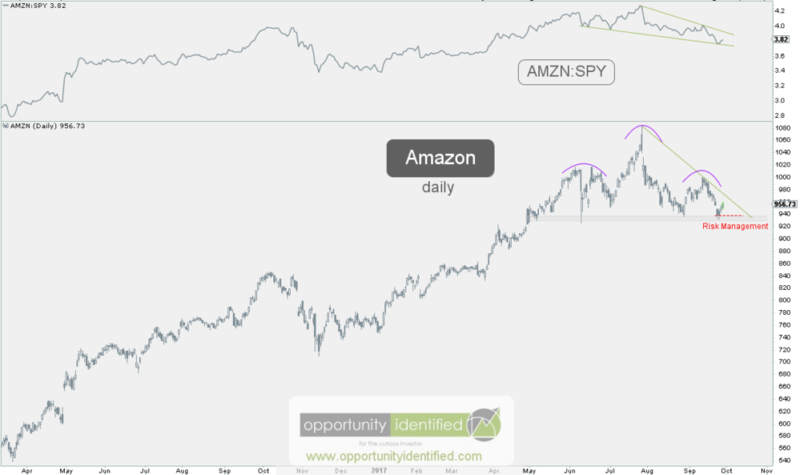 From an upside target perspective, Amazon will need to first clear the downtrend line (in green) and then sustain above the left shoulder highs near 1,011. If it can close above, and hold, those levels, it’s like a new series of higher highs and higher lows are upon us. Another possibility is price continues to be range bound between 935 and 1,000 through the end of the year (this would bring time symmetry to the right shoulder, matching the time duration of the left shoulder). Trade accordingly. In conclusion, the game plan is simple. If Amazon closes below 935, we want nothing to do with it. Above that level, it makes sense to own one of the top three appreciating stocks of the past decade. Get yourself on the right side of the trade. We don’t need to experience capital crushing drawdowns. Trade at your own risk. AND, you’ve got FREE access to a great tool we’ve created, The Ultimate ETF Cheat Sheet. Click this link to get your FREE easy-to-use resource guide for all your ETF needs. Disclaimer: Nothing in this article should be construed as investment advice or a solicitation to buy or sell a security. You invest based on your own decisions. Everything in this post is meant for educational and entertainment purposes only. I or my affiliates may hold positions in securities mentioned in this blog. Please see our Disclosure page for full disclaimer.